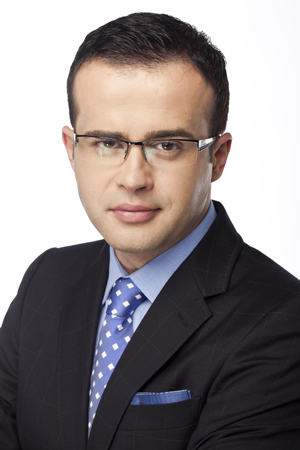 Mihai Gîdea is one of Romania’s premier journalists and the guiding force behind ANTENA 3, the country’s highest-rated news channel. The Association of Broadcasting Professionals awarded him the Best Talk Show Host for 2010; and in 2011 honored him with a special Jury Prize for Best Talk Show. Mihai began his television career in 2002 as a producer and in 2004 he joined Intact Media Group where he was an on-camera presenter and began his award-winning talk show SINTEZA ZILEI (2005). In 2007 he assumed the role of CEO and launched ANTENA 2 which, after only 3 years, became one of the Top 10 most watched television stations in the country. Beginning in June 2010, Mihai assumed the roles of CEO and General Manager of ANTENA 3. Under his leadership ANTENA 3 has experienced incedible growth becoming the #1 news stations and, on many days, the #1 TV station in the country. Mihai was born on the 10th of January 1977, in Bucharest where he graduated the Theology Faculty from University of Bucharest. His hobbies are literature and philosophy. He is married and has a daughter.